Residence 1001 sits perfectly above the treetops of Central Park in the iconic Essex House, a building that presents the perfect combination of art deco charm and modern convenience. 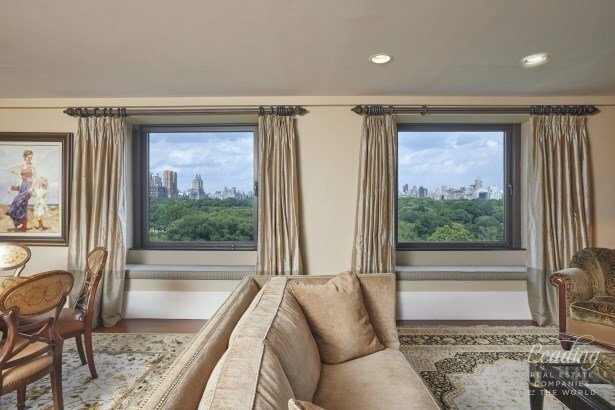 This three-bedroom, three-bathroom residence features a 50+ foot expanse of breathtaking views of Central Park and Manhattan skyline. This home has a large eat-in kitchen with Miele and Sub-Zero appliances and custom cabinetry.Measuring 2,261 square feet, the apartment has direct Central Park views from the Living Room, third bedroom/study and kitchen. The open living/dining room is perfect for entertaining and boasts beautiful walnut floors, as does the gracious entry gallery and foyer. The master suite features double walk-in closets and a beautiful marble bath. The second bedroom has an additional oversized walk-in closet and ensuite bathroom. The third bedroom is currently configured as a lovely paneled home office and may be used as a formal dining room. The apartment also features coffered ceilings and beautiful French doors to the bedrooms.The Essex house was built in 1931 as the largest and most luxurious hotel in Manhattan. Now managed by J.W Marriott with 185 privately owned residences; resident owners, tenants and guests can enjoy unrivaled white glove hotel services and world-class amenities including 24 hour in-room dining; valet, concierge and bell staff; a fitness center and spa; a business center and the award-winning Southgate Bar and Restaurant. Housekeeping is provided upon request and includes bed and bath linens. This special building with history and allure is in the heart of New York City, close to Fifth Avenue shopping, museums, Carnegie Hall, Broadway and Lincoln Center. This home is a perfect full time residence as well as a fantastic pied-a-terre for buyers wanting the ease and comfort of a lifestyle afforded by first class hotel living.